The seventh annual Houzz & Home Report has some important news for lighting and home furnishings retailers and interior designers. Check them out and see how your store or design firm can benefit. 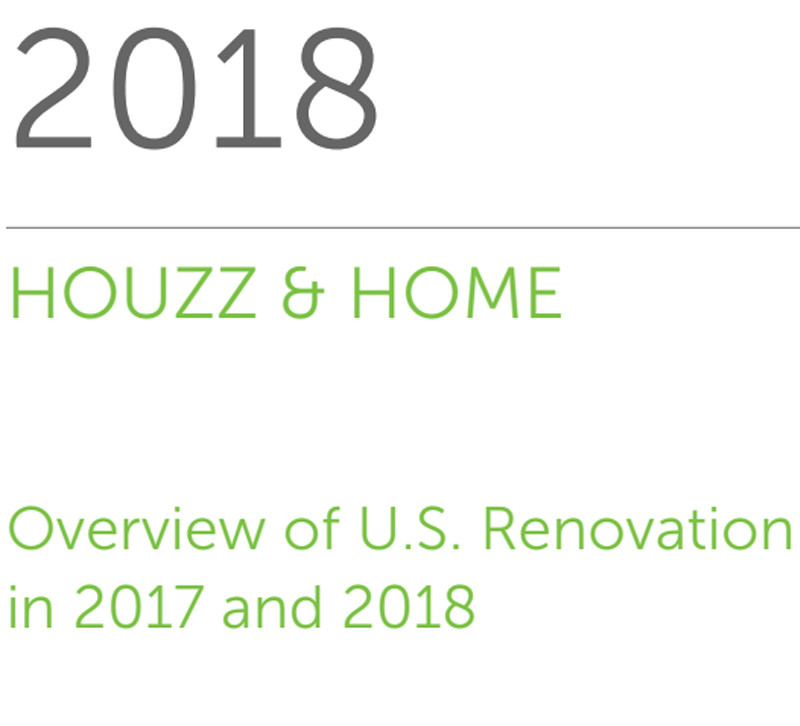 Each year, Houzz.com releases its annual report on home renovation trends, and its 2018 Houzz & Home Report delivered key findings and helpful insights as to what homeowners are renovating and how lighting and home furnishings retailers and interior designers can help. You can read the full report here, but here are four key takeaways you need to know right now. Since the recession, homeowners have become more budget conscious and more likely to set a budget for a home renovation project. In 2015, only 69 percent of homeowners had an initial budget, compared to 77 percent of homeowners in 2017 who set budgets. But having a budget doesn't mean the homeowners will stick to it, although many do. In 2017, 55 percent of homeowners who did have an initial budget either stayed at budget (49 percent) or came in under budget (6 percent). Another 27 percent were less than 25 percent over budget while 19 percent exceeded their budget by 25 percent or more. Houzz dove a little deeper into those who went over their budgets and found that the two biggest reasons for going over budget were the choice of more expensive products and materials (42 percent) and the products or services costing more than originally thought (41 percent). The third biggest reason was that the project was more complex than originally thought (31 percent), and here's where there is an opportunity for lighting and home furnishings retailers. Of those homeowners who were surprised by a project's complexity, 39 percent of them were first-time buyers and 36 percent of them were repeat buyers. This may be caused by what those in the industry refer to as the DIY Effect — the effect of home renovation programs on HGTV and on social media present homeowners with an unrealistic idea of what a home renovation project takes and costs. Clearly, there is a need to reset some expectations. For retailers and designers, the easiest way to start resetting expectations is to start blogging and talking about these issues with clients. You have so much insider knowledge to share with prospective clients, and you might be able to answer questions and set expectations. By blogging, you demonstrate expert knowledge and you begin building a relationship with clients before they even stop by your showroom. If you have a blog, plan a series of posts on the costs of renovations and walk your prospective clients through the process. Talk about where problems may arise, how they should budget and where they might be able to cut costs. Blast your blogs on social media and to your email subscribers. Go live on Facebook and talk for 30 seconds about your blogs and direct your followers right to it. You may not be able to reset every expectation, but you may be able to answer a few important questions. All year long, we've been reporting on the rise of the smart home (you can check out Parts One and Two of our Year of the Smart Home feature), and while the number of homeowners installing home automation systems did increase (from 19 percent in 2015 to 23 percent in 2017), home security actually saw the largest change over the last few years — it's up 50 percent from 10 percent in 2015 to 15 percent in 2017. From this, it seems homeowners are becoming more interested in home security systems, so for retailers, showing consumers how automated lighting can help with security may be a smart tactic. Having the power to turn lights on and off from an app or set a timer for indoor and outdoor lights can help customers feel more secure about their homes when they leave for longer periods of time, and your sales associates can demonstrate how easy these systems are to use. The previous Houzz & Home Report found that homeowners invested 24 percent more in their laundry rooms from 2016 to 2017. This year, the report puts that into perspective. According to the report, 15 percent of medium homeowners planned to upgrade their laundry rooms, and just as many said they planned to upgrade their patios or fences. Similarly, 10 percent of homeowners plan to renovate a home office, and just as many plan to renovate a shed or workshop. For retailers, this means that the outdoors are becoming a priority on par with some interior spaces, and that's telling. If your showroom is not already carrying outdoor accessories or furniture, then it may be time to test the waters. If you're heading to Atlanta or Las Vegas for markets this month, consider purchasing a few outdoor accessories — outdoor rugs and pillows, stylish planters, portable outdoor lamps — and see how they do. You may find customers that want to make small upgrades to spruce up their spaces. Homeowners take hiring an interior designer or architect seriously — so seriously in fact that on average, they only consider two candidates when deciding who to hire, according to Houzz's study. That's not a ton of wiggle room for interior designers and architects. This means designers and architects have a short opportunity to reach clients and encourage them to seriously consider their services. To be competitive, designers and architects should be active on their websites and blogs. That means websites should be responsive and have a portfolio full of great examples of past work. On social media, design firms should be posting regularly to show their most recent work and give potential clients an idea of what it is like to work with a particular design firm. If nothing else, setting up a Google My Business page should be mandatory for all design firms. This registers your firm with Google and helps Google boost your website and business for local searches such as "interior designers near me" and "interior designers in Baltimore." What stood out to you in the 2018 Houzz & Home Report? Share with us in the comments!